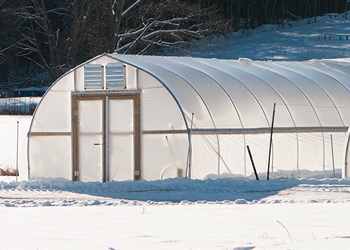 The recommendations here are based on recent overwintering trials conducted at our research farm in Albion, Maine, located in hardiness zone 4B. For best quality and yield in your own overwintered onion crop, be sure to take your latititude and growing zone into account, and adjust dates and materials accordingly. Your local cooperative extension agency can also provide guidance for your region. With Labor Day approaching, the trialing and growing season here in Maine is in full swing. The early lettuce trial has been fully evaluated, cucumbers and summer squashes are being harvested by the crate-full, and tomatoes are blushing into their true, fully ripened colors. While you're enjoying the bounty summer has to offer, it is also time to begin planning for the coming winter and, depending on your location, there may only be matter of weeks until the first frost. 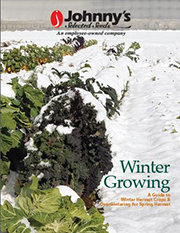 Now is the time to decide if you will be planting for winter harvest and overwintering — winter is no longer the season when all horticulture ceases. Planning now can allow you to harvest over the course of the winter and into early spring. A recent overwintering trial, housed in a 200-foot-long Gothic high tunnel on our research farm in Albion, contained many different types of greens that were harvested throughout the winter. Aside from greens, we harvested a load of fresh, full-size onions on May 27th. 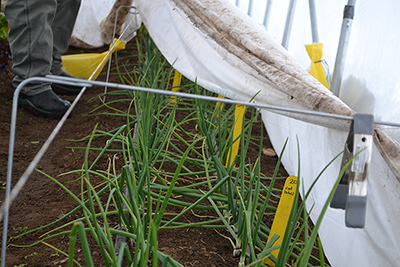 Here are the details on how we brought our onion trial through the Maine winter to a successful spring conclusion. Though it doesn't look like much is going on here, inside the Gothic high tunnel our onion overwintering trial continued on course, ultimately delivering both useful information and flavorful spring onions. Our trial was sown in flats in the greenhouse on August 24th, and for us as for many growers, planning to prepare for the sowing a few weeks in advance, by selecting varieties and gathering necessary materials, is ample timing. For most growers, any time in late August to early September is acceptable for seeding onions for overwintering. The onion seedlings were transplanted into the Gothic high tunnel almost 5 weeks later, on October 3rd. 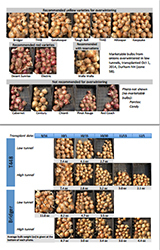 Growers generally aim to transplant onions for overwintering from late September to mid October. As noted in the section of our Winter Growing Guide devoted to Recommended Crops & Varieties, the goal is to have the onion seedlings reach the size of a pencil (about 4–5 leaves) before the hard freeze. Where practicable, planning for multiple sowing and planting dates will help ensure a favorable outcome. On days where conditions were favorable, the Agribon layers were pulled back for optimal circulation and photosynthesis. Using a double layer of the lighter-weight, more flexible Agribon-19 facilitated removal and recovering the rows of onions, as day–night temperatures rose and fell over the course of the trial. As October gave way to November and nighttime temperatures began to dip below freezing, the plants were covered with two layers of Agribon-19. While we were still enjoying the mild daytime temperatures of fall, we removed row covers during the day to allow for air flow and exposure to sunlight, both of which are very important to the health of the plants. By only covering the plants when temperatures fell below freezing, the plants were able to become incrementally acclimated to colder conditions, and better prepared to enter the coldest temperatures of winter without being shocked — similar to the process of hardening-off tender seedlings started indoors, before transplanting them out into the chilly, gusty conditions of spring. 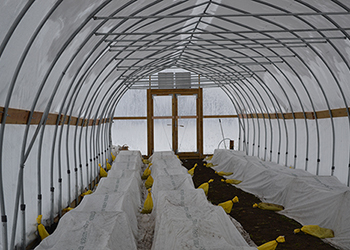 Here's a shot of the high tunnel interior in winter's depths. Row covers were left in place during deepest winter, keeping the onions snug in their beds. Air and soil temperatures continued to drop as we descended into winter, but the average daily soil temperature rarely fell below 30°F/-1°C, and the coldest recorded soil temperatures were about 27°F/-3°C. However — as anyone who has experienced a Maine winter understands — it can get brutally cold at times, raising concerns about the survival of the trial. In the depths of January and February, the row cover stayed on all the time. Row covers were removed, once the warmer days of spring arrived. When spring and warmer temperatures finally did arrive, the row covers were removed as often as possible when air temperatures rose above freezing during the day, and for good once temperatures began to moderate. 'Bridger' performed best in our overwintering trials. The plants began to grow again, and finally started to bulb-up in early to mid May. After we evaluated all of the varieties, 'Bridger' was the clear winner of our early trials. In subsequent trials we have also found the gorgeous, red-purple 'Desert Sunrise' to be excellent for overwintering from seed. For those who wish to overwinter without the labor of seedling production, the classic best choice is to grow 'Forum' onions from sets. Bolting was the prevalent problem in all of the other varieties — some without a single plant that had not formed a flower stalk. Some varieties were also very susceptible to botrytis. Not the case with Bridger: the bulbs were uniform and sizeable, with clean foliage, and only 7% bolting occurrence — a homerun for overwintering. Overwintering crops is not an easy task, but if you have the market for these types of products, it can be a worthwhile endeavor. 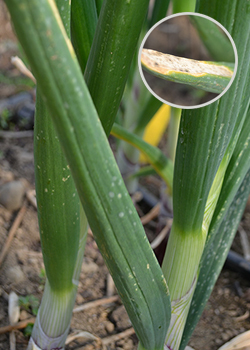 Here are some common problems that might be encountered in onions overwintering in a cold climate. 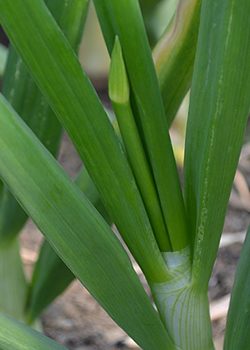 Bolting is probably the most common problem to arise from overwintered onions. As you likely already know, onions are a biennial crop, so exposure to cold temperatures will signal the plant that it is nearing the end of its lifecycle. In response, it will send up a flower stalk to produce the next generation. 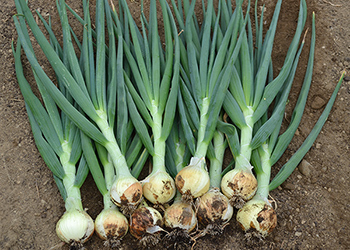 For onions, bolted plants yield a bulb with a tough center that has "off" colors. Bolting will also cause the bulb to stop growing, so you may also end up with smaller bulbs than is desired or marketable. Bolting doesn't always mean that a variety is not suitable for overwintering. Success in overwintering depends largely on experimenting with seeding dates at your specific location. Plants will be more prone to bolting come spring if they are too large going into the winter. Bridger has proved to be very bolt-resistant in many trials, so it is a good variety to try first. In addition to using a bolt-resistant variety and experimenting with planting dates, you should also try to prevent large fluctuations in temperature in your growing environment through good ventilation. This disease is caused by the fungus Botrytis squamosa . It favors moist environments and initially shows up as small white spots or flecks on the leaves. As the disease progresses, the white lesions expand and the leaf will become sunken and brown, and eventually die (image inset). Because botrytis thrives in humid conditions, ensuring that your tunnel is well ventilated and lowering the humidity around the plants by removing row covers as often as possible will help to prevent this disease. 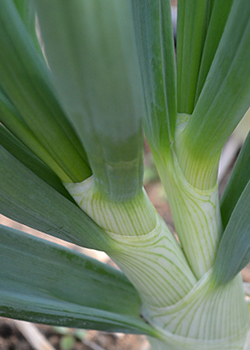 If any of your plants have split into two separate stalks, then you have a double bulb. 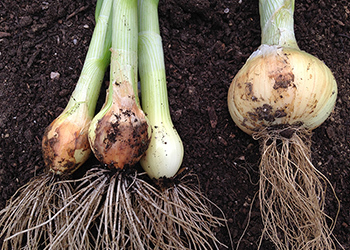 Double bulbs are generally considered unmarketable, but are still edible if you aren't picky. 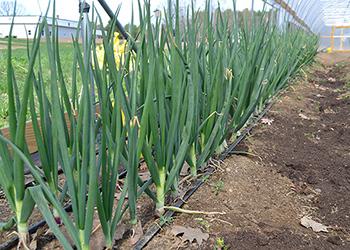 A number of factors can cause doubles, from the genetics of the variety to inconsistent watering, but for overwintered onions, it is most likely caused by fluctuating temperatures — another reason to ensure good ventilation in your structure. Onions require full sun, and anything less will result in small plants and therefore, small bulbs. The southeast side of our tunnel sits near an apple tree, which while beautiful when filled with blossoms and later with apples, casts just a bit of shade on that portion of the tunnel. The plants in this portion of the tunnel were noticeably smaller than the plants in areas with full sun, so even a small amount of shade is something to consider. When you are planting in the autumn and the leaves are falling, don't forget that they will be back in the spring and could shade your crop! Removing the row covers as much as possible will also help expose the plants to better sunlight in general. As one would expect, not all varieties or even individual plants can withstand the extra stress of winter conditions, even when protected by a tunnel. Perhaps it was too cold, or the bulbs were subjected to damage by rodents looking for a midwinter meal, or the plants weren't well established going into the dropping temperatures. There are any number of reasons why some of our onions will not overwinter and, ultimately, die in the process. Sometimes it's for reasons within our control and sometimes not. Either way — because we look forward to another harvest of delicious, full-size onions in early spring — we'll be taking notes, making some adjustments, and trying again this year. 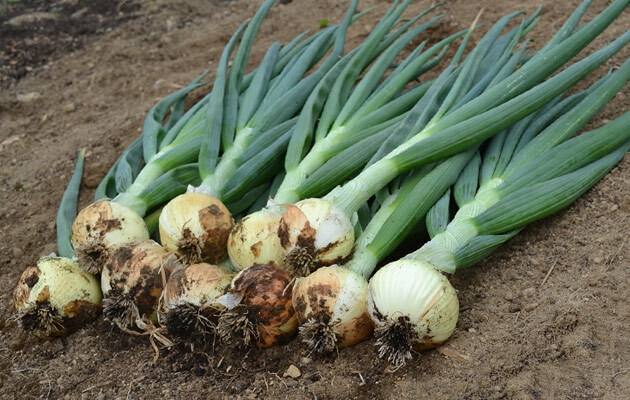 If you are interested in reading more about cold-climate overwintering of onions, check out these reports from trials conducted in New Hampshire by Dr. Becky Sideman and colleagues. 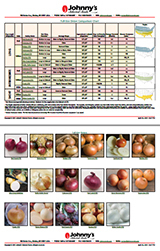 Use our dynamic comparison chart to review distinguishing characteristics and features of our full-size onion varieties.